This song has no relation to the traditional song of the general title. 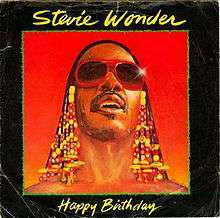 "Happy Birthday" is a 1981 single written, produced, and performed by Stevie Wonder for the Motown label. Wonder, a social activist, was one of the main figures in the campaign to have the birthday of Martin Luther King, Jr. become a national holiday, and created this single to make the cause known. Besides being released as a single, the song also appears on Wonder's album Hotter Than July. Although the single failed to reach the Billboard Hot 100, it charted on the R&B chart, and it became one of Wonder's biggest hits in the UK, reaching No.2 in the charts in August 1981. 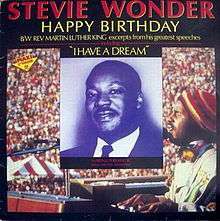 ↑ "MLK Day: Why on Monday and what was Stevie Wonder's role?". USA TODAY. Retrieved 2016-01-18. ↑ "Stars perform at Diamond Jubilee concert". BBC News. 2012-06-04. Retrieved 2012-06-06.